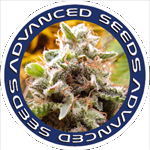 Advanced Seeds - Critical Purple Kush. Free US delivery. Critical Purple Kush is a hybrid with great flavor and excellent resin production that is born from the crossing of two of the most prized clones of Advanced Seeds’ private gene pool, Critical and Purple OG. Sweet flavor and complex aroma in which you can find the notes of coffee and soil. Pest resistant. Indoor height:	75 - 100 cm.\r\nOutdoor height:	200 - 250 cm.